In a disturbing video, a tiny dog lies flat on the ground as a man hits him with a whip. 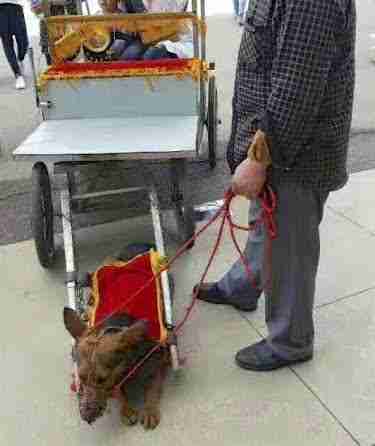 The dog can’t get away — he’s tethered to a cart, which the man is trying to ride. But when the dog stops moving — probably out of sheer exhaustion — the man beats him harder. 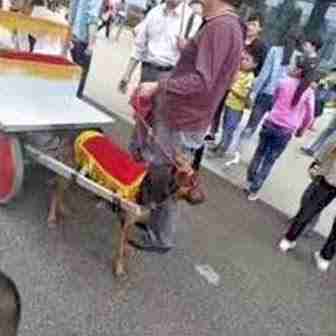 While the man in the video seemed to be using the small dog to pull a personal cart, people in China are now using dogs to pull rickshaws — two-wheeled hooded vehicles used to transport people, according to animal welfare advocates. The dogs are tethered to the rickshaws with rope harnesses, and sometimes wire-framed head constraints, which would be painful and uncomfortable, Brown said. Then there’s the weight the dogs have to pull behind them. 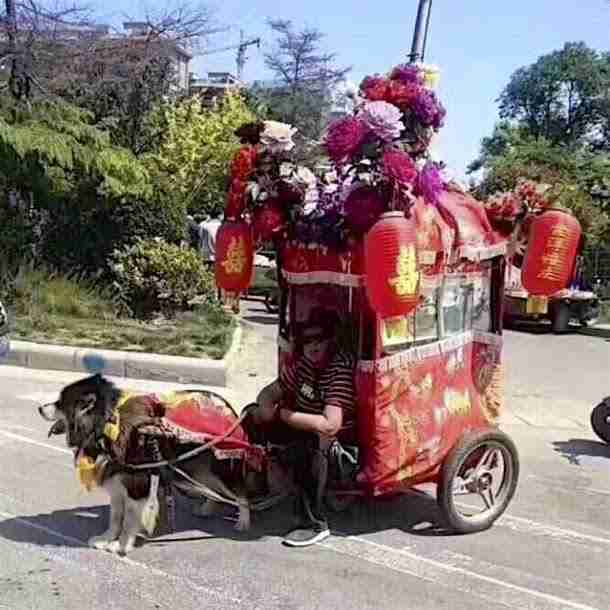 Pulling one person would be hard enough, but recent images show dogs having to pull a driver and two or three passengers, as well as the rickshaw itself. When the dogs do eventually collapse, they’re probably slaughtered for their meat, Brown said. 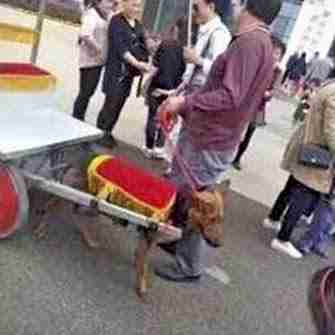 Brown said that since there are no animal cruelty laws in China, it’s difficult to stop these sorts of abuses — and easy for them to gain popularity. What make rickshaws even worse is how they potentially feed into the meat trade. It’s estimated that people kill over 10 million dogs for meat each year in China, as well as about 4 million cats — and most of these animals are either caught on the streets or stolen from families, according to a spokesperson from Humane Society of the United States (HSUS). 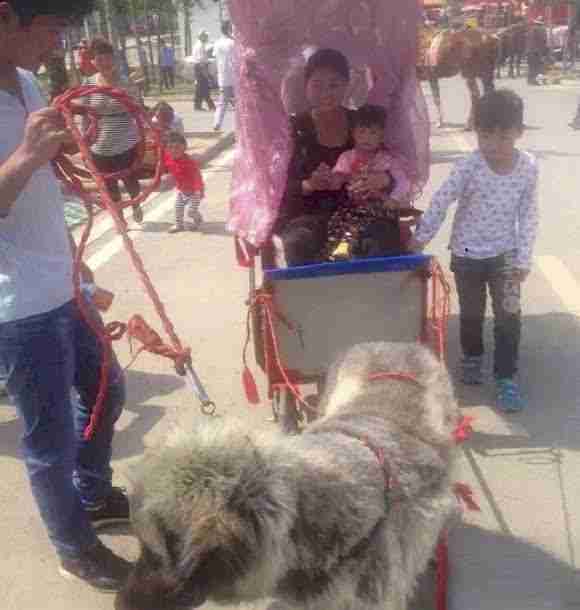 It’s unclear where the rickshaw dogs are being sourced from. Despite the dangers that dogs face, many people are willing to stand up and protect them — and the animal welfare movement is growing in China. Brown also explained that an increasing number of people are keeping dogs as pets in China, and she believes that this is having a positive impact on animal welfare issues. To learn more about animal welfare issues in China and other parts of Asia, follow Fight Dog Meat on Facebook. Another way to help is to make a donation to the Humane Society International (HSI), which rescues dogs and cats from meat farms in China.